Few images are more patently pastoral than a pink-skinned pig wallowing in the farmyard. 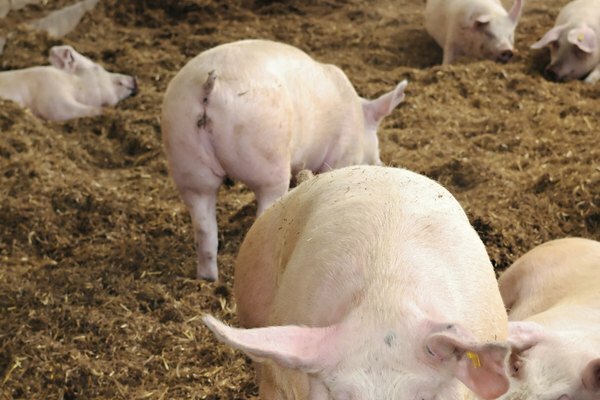 In addition to adding profit value to a farm's bottom line, the hog is a fascinating creature, full of personality and an intelligence that surpasses other barnyard animals. Though as a species, pigs are descended from wild boars, centuries of breeding has produced a wild range of characteristics, with a few breeds enjoying widespread popularity. The Yorkshire first emerged in England, where the breed is still referred to as the large white, but after arrival in Ohio in the 1830s, the Yorkshire became a national favorite. 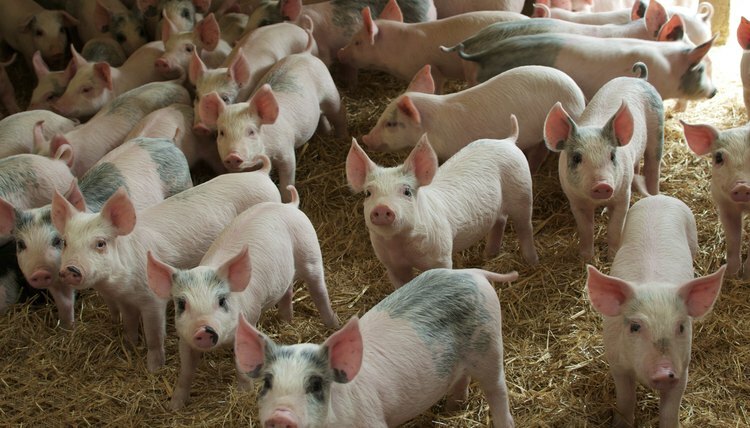 Commercial pig farms prefer the breed, as the docile pig is well-suited for breeding in indoor operations. A long, white pig, the Yorkshire sports a lengthy belly, a trait that translates to bacon on the production end. Other notable traits include small, upright ears, a dished nose and excellent mothering abilities. 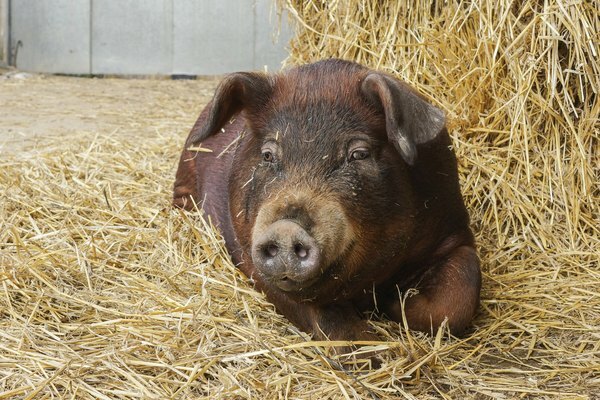 The Berkshire was once known as the “ladies pig,” as the breed's small size and friendly personality were considered ideal for female pig keepers. The breed produces a dark meat that's recognized for having superior flavor over most other hogs, a trait that's earned the animal a consistent popularity over the years. 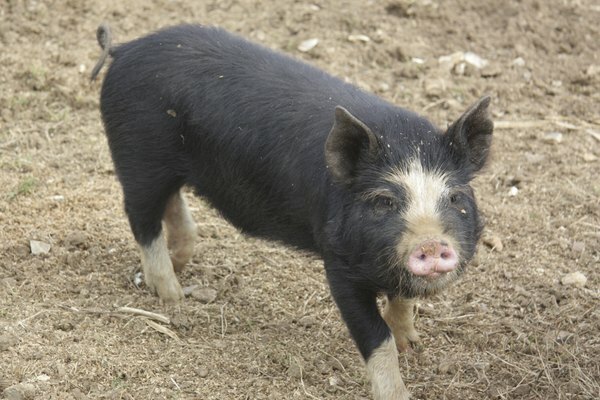 Berkshire hogs are black with white points on the legs, face and tail, upright ears and a stocky, notably muscular body type. Though of some use in commercial farms, Berkshires are currently most popular with small farm operations. The duroc is a true domestic product, first recognized in 1823 New York, and it's remained favored since, currently enjoying No. 2 status in terms of national popularity. Durocs convert feed to body mass better than any other breed in America, a very attractive trait for producers seeking maximum profit. Durocs are red-skinned with coats of red, brown or even black hair covering their body, and feature short snouts and short, floppy ears. Some pig breeds thrive indoors, while others only do well outside. The Chester white is remarkably versatile. The most durable of all the white pigs, Chester whites do equally well in indoor, intensive operations and outside on pasture, however, their pale skin can sunburn, so shade is required. Unlike Yorkshires, a purebred Chester white may have black spots on her skin. The long-backed, lop-eared pig can gain up to 1.36 pounds of body weight for every 3 pounds of feed, a remarkably efficient conversion rate.